Decorating for Easter is not nearly as difficult as many believe. In fact, there are a number of ways that you can decorate using things that you may already have on hand. If you are someone who normally hangs a wreath on the front door, we have a great collection of DIY wreaths that are creative, fun and best of all, easy to make. Whether you want to hang a colorful wreath to show off those spring hues or you prefer something elegant and classy, there is certain to be a wreath in this collection that is perfect for your decorating. Many of the wreaths use candies and other Easter decorations that you can pick up at your local Dollar Store for next to nothing. Others are completely homemade and use supplies that most crafters will readily have available. Whatever your preference and however you want to show off your Easter decorating skills, we have just the wreath for you to make and hang. 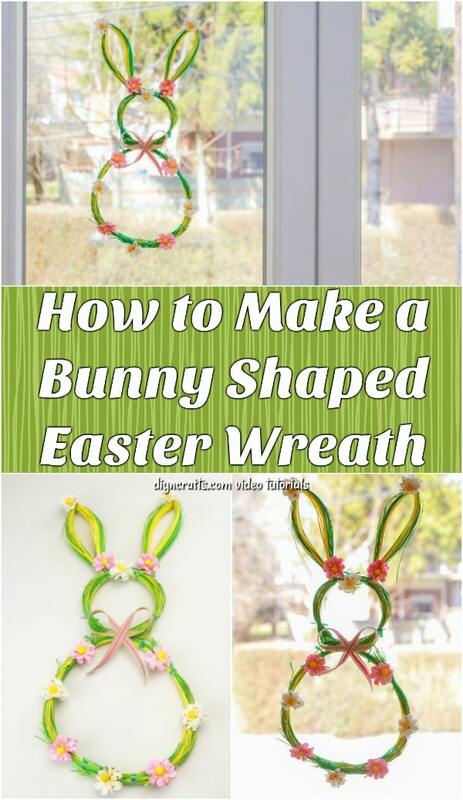 These wrapping paper wreaths are very popular for the Christmas season but you can incorporate the same general idea into creating your Easter wreath. Simply choose wrapping paper that is spring themed. Many birthday papers have bright colors and pastels that will look beautiful adorning your door. 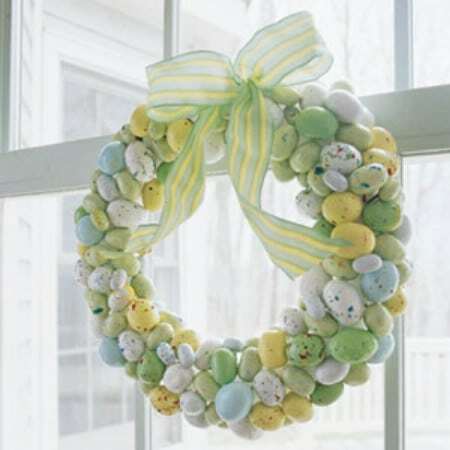 Add some colorful ribbon and even a plastic bunny or chick and you have the perfect wreath for Easter. 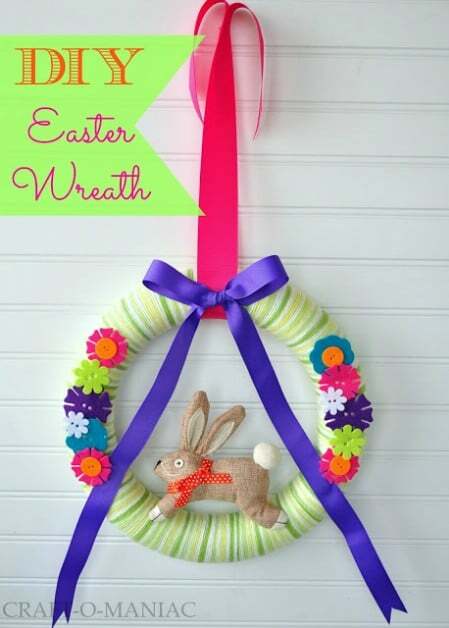 This easy to make Easter wreath is shaped like an Easter Bunny and it is so cute! 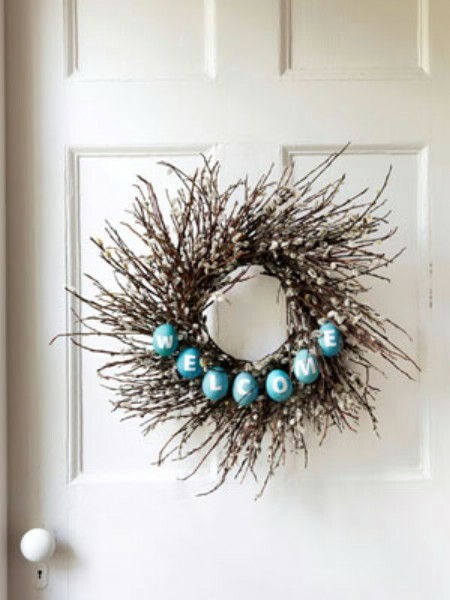 You only need about $5 worth of supplies and around 15 minutes or so to make this one, and it’s the perfect DIY wreath for your front door this Easter. 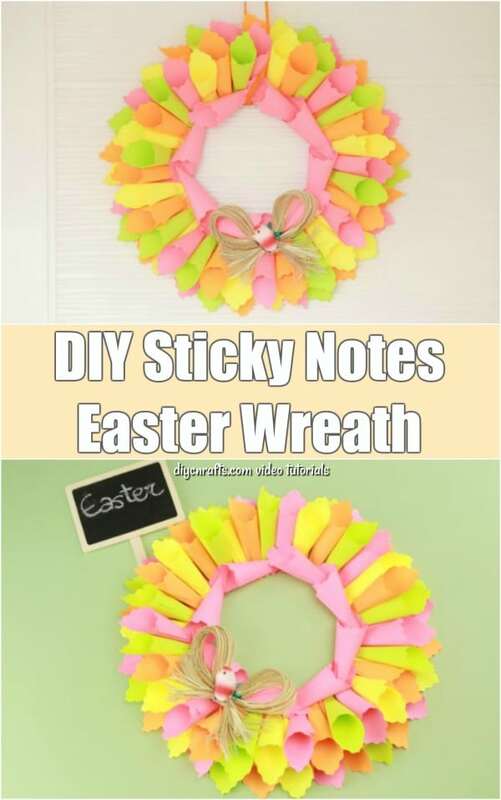 If you want a DIY Easter wreath that is colorful and really unique, this wreath that you make out of stick notes is it. This is such an easy project and it takes little time and little money to get this colorful wreath for your front door. You can use a square form for this wreath or craft one yourself if you prefer. The grass can be found at your local craft store and depending on the size that you want, one package of grass should work perfectly. 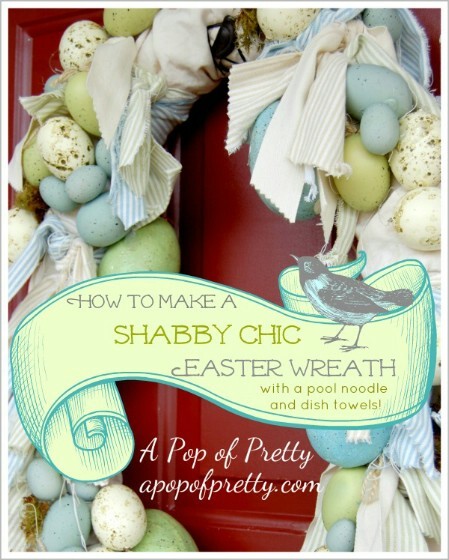 You can adorn the wreath with plastic eggs, ribbon or anything you want. If you prefer just a spring wreath and one that will work past Easter, choose ribbon and silk flowers in bright or pastel colors. 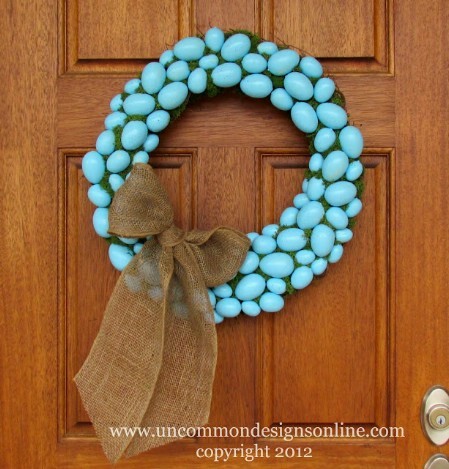 Blue robin’s eggs adorn this lovely wreath that will be perfect for Easter and in the weeks leading into summer. You can find small wooden or plastic eggs at most Dollar Stores or at your favorite craft store. If you can’t find them in robin’s egg blue, you can simply spray paint them and then add them to a grass or moss wreath. 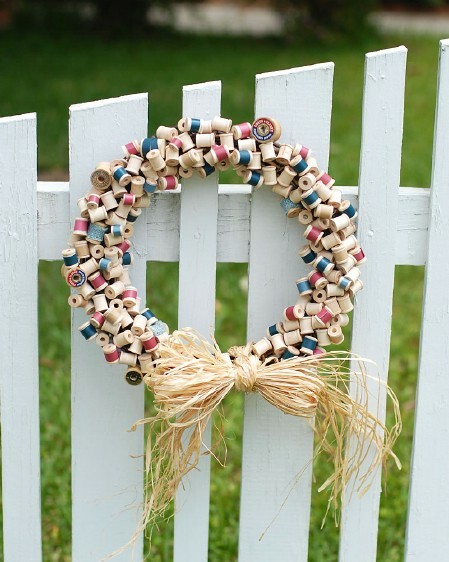 Tie in a burlap ribbon and your door is sure to please guests and neighbors alike. You don’t have to go off and buy an expensive wreath to decorate. You can actually make one yourself and then just cover it with white fabric – or any color you desire. 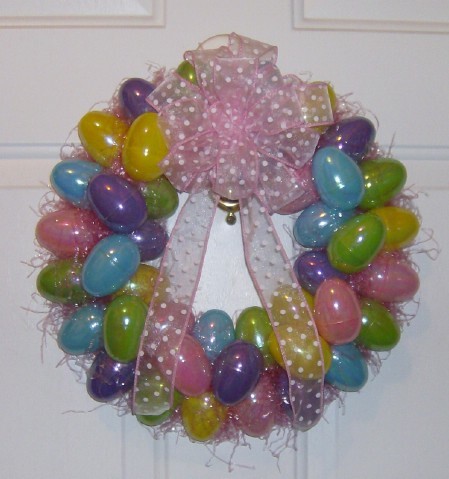 You can then dangle a few beautifully decorated plastic Easter eggs from the center and you have the perfect wreath for Easter. 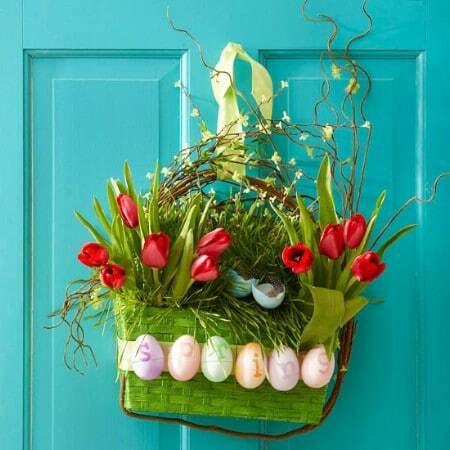 Note that you can make the eggs removable so that you can add flowers or other dangly things for after Easter to keep your wreath on the door until summer. Plastic Easter eggs cost about a dollar for a package of 12 or so and just a couple of packages will help you to create a beautiful and very colorful wreath for the Easter season. You can do this in different colors or choose one or two colors to make it more uniform and elegant. Highlight the eggs with faux grass, ribbon or whatever you want to make it really stand out. The best part of this wreath is that you don’t need to purchase a wreath form. You can simply cut one out of cardboard. Grapevine or twig forms work well to create a bunny wreath that includes a head, body and of course the ears. You can use berries (plastic ones of course) to highlight the wreath and make it more elegant. Larger berries work well for the body and smaller ones work for the head. The forms can be molded to create the ears and you should be able to find these at your local craft store. Flowers made from tissue paper put together make a beautiful and very spring-like wreath. The flowers are really easy to make once you get the hang of it and you can combine different colors and sizes to make a wreath that is perfect for your front door. The flowers look like roses and are beautiful when finished. You can add greenery if you like or simply use the flowers to create a stunning wreath that is sure to express your spring fever. 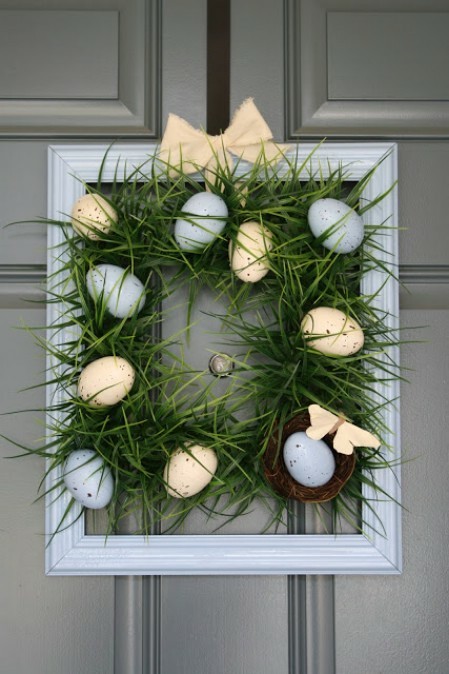 A twig wreath form can be used to create a lovely welcome wreath that is adorned with painted wooden or plastic eggs. If you don’t want to purchase a wreath form, consider gathering a few twigs and simply make one yourself. If you want to be really creative, you can make the message eggs from real eggs that have the insides blown out and then are dyed and decorated. 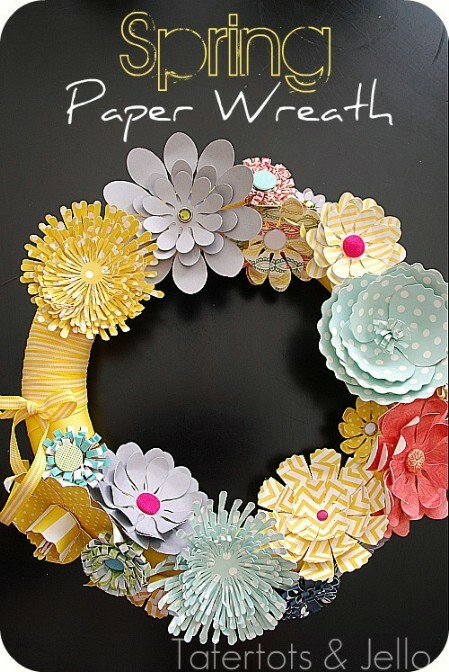 Cut outs and embellishments create a beautiful flowered wreath that you will want to display for years to come. You can create flowers in different sizes and shapes and out of differently colored papers so that it is really colorful. If you prefer, simply choose one or two paper designs to make it a bit more elegant or go all out and use a different paper design for every flower that you incorporate. 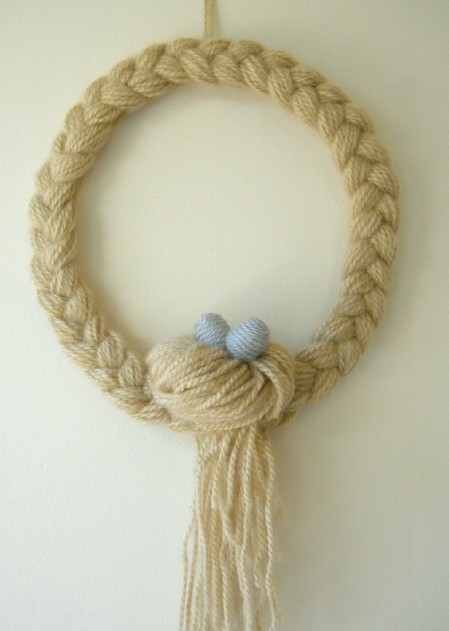 For a rustic and really classic look, why not create that wreath out of burlap? 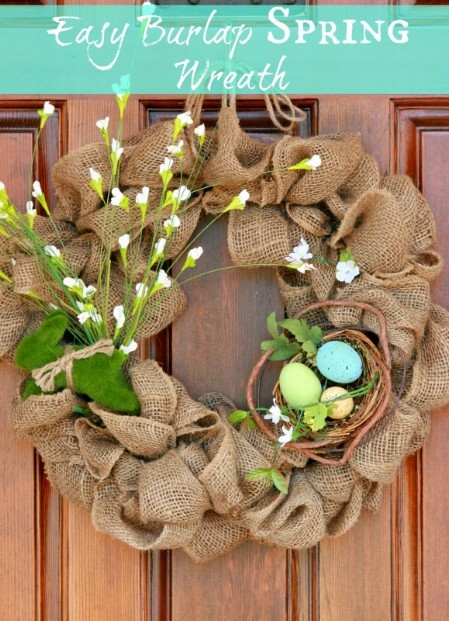 Layered burlap gives you a full and luscious wreath that you can adorn with plastic or wooden decorated eggs, decorative birds or even a small bird’s nest. 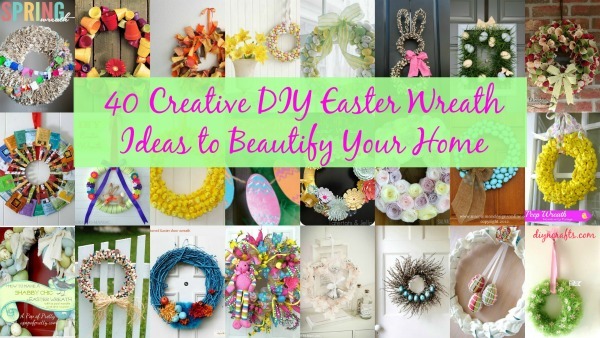 This is a great country looking wreath that will take you less than two hours to create and will become a favorite Easter decoration instantly. 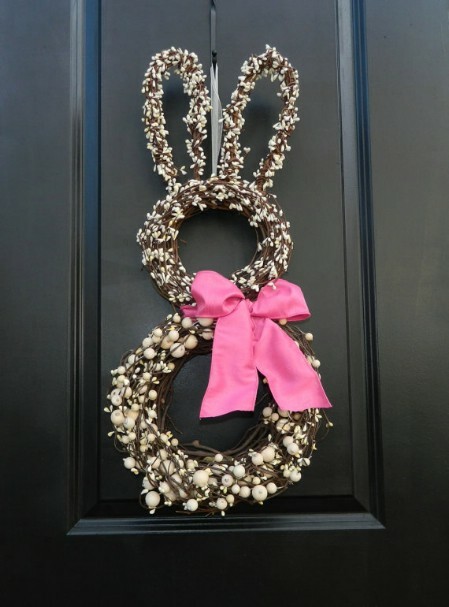 If you want to adorn your door with Easter eggs, you can create a beautiful springtime wreath malted milk egg candy. The candies come in different sizes so your wreath will be full and of course the yumminess of the candies speaks for itself. 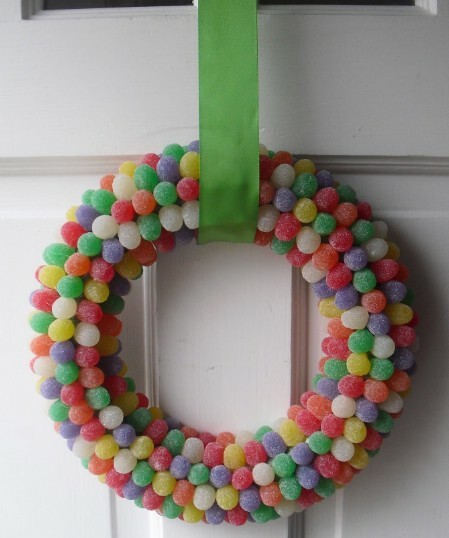 You will need a foam wreath ring and several packages of the candy to create a rather large wreath. Just remember to preserve it if you want to keep it for next year. Yarn comes in all types of colors and designs and is perfect for creating an Easter wreath. If you have a wreath form (if not, you can pick one up at your craft store), you just have to cover it and then add felt flowers or whatever shapes you want. 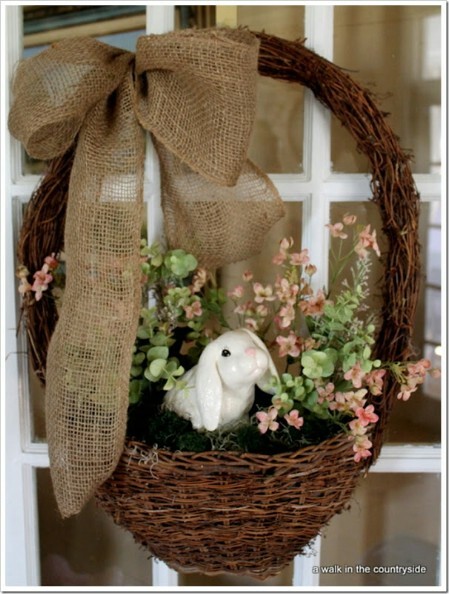 A stuffed rabbit in the center makes this wreath very whimsical and gives it country charm. 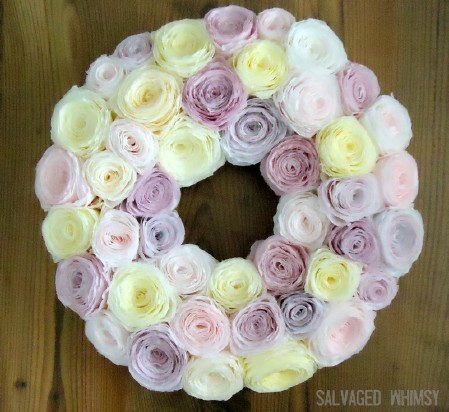 Silk flowers taken apart or some silky fabric can be used to create a shabby and chic wreath that is both elegant and colorful at the same time. 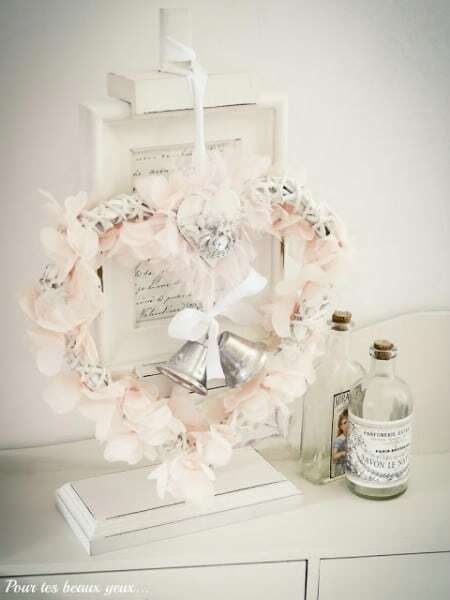 This wreath is beautifully adorned with silver bells and other vintage looking embellishments. You can hang it with a white silk ribbon and make it in whatever size you need for your door or as a general decoration for tables and other areas of your home. Who says gumdrops are only for Christmas? 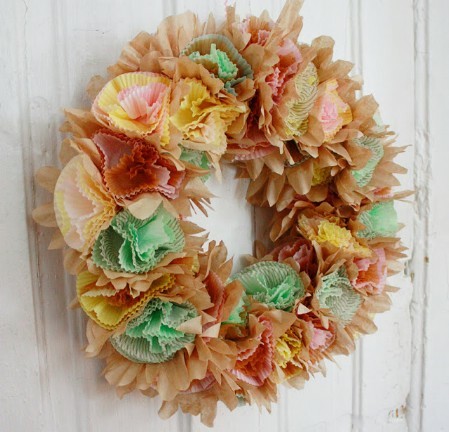 You can use gumdrops to make a beautifully colored and bright wreath for your Easter decorating. Just pick up several packages of these yummy sugary candies and put them on a foam wreath ring. You will need to preserve them so no eating them after you have made the wreath. This is a very easy project and one that you can keep for years to come – provided you preserve it of course. 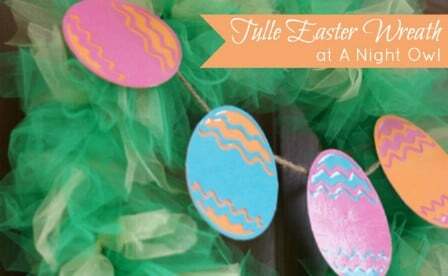 Jordan almonds come in beautiful pastel colors and are great for creating an Easter wreath. The little candies are the perfect shape for making a wreath, which just needs to be put together to hold the almonds in place. Add a colorful ribbon and any other decorations that you want to show off and hang this yummy and beautiful wreath on your front door or around the house for added décor. 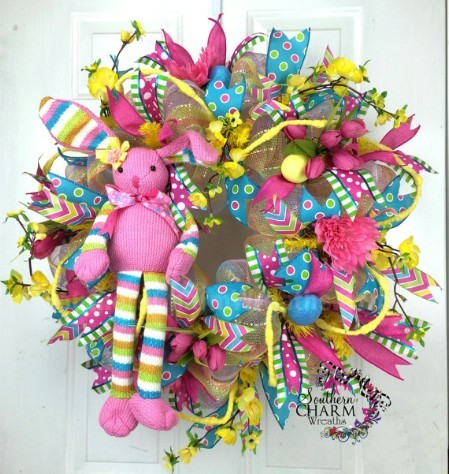 Vibrant colored ribbon, plastic Easter eggs and an adorable stuffed bunny complete this deco mesh wreath that is sure to look beautiful on your front door. You can use ribbon, fabric or basically anything you want to create the colors and then just add the embellishments that you want to give it a little uniqueness. A stuffed bunny gives it adorable charm. 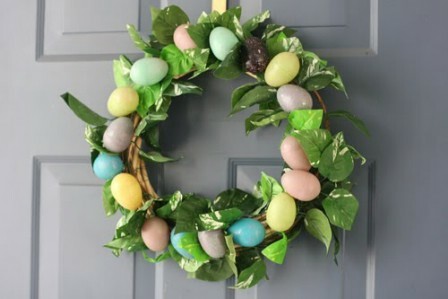 This is a very inexpensive and easy to make wreath that incorporates a bit of greenery along with colorful plastic eggs. The entire project costs just around $4 including the wreath form so you could save even more if you made your own form. You just have to attach the greenery, which can be from something that you have lying around the house and add as many plastic or wooden eggs as you choose. You can pick up tulle in multiple colors at most craft stores and use that tulle to create a beautiful and very elegant looking wreath. You can use multiple colors or just one, whatever your preference. Adorn your wreath with plastic eggs or other Easter themed decorations and ribbon to make it beautiful and even more colorful. You could also cut out paper Easter eggs and decorate them to make it really unique. 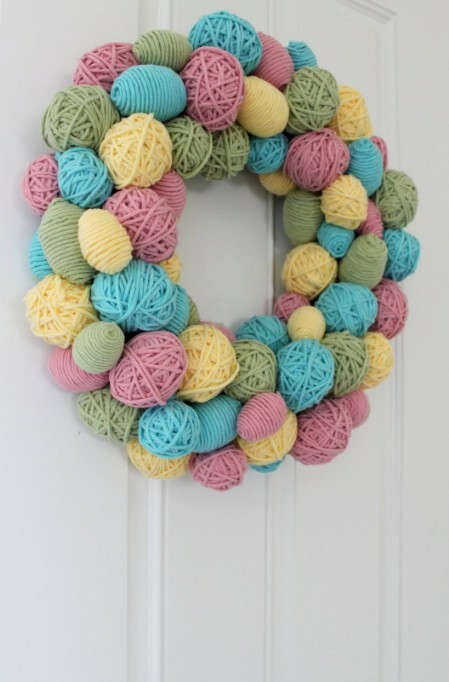 Some plastic eggs, yarns in different colors and a couple of hours are all you need to create this beautiful and very unique wreath. You will need to wrap your eggs, which can be plastic or wooden, in the yarn and you can even put small balls of yarn in the wreath as well to make it fuller. Add decorations or other adornments as you wish to create a unique look and hang with a ribbon for an added splash of color. Vibrant blues and deep reds work well when combined and make this wreath something that will be the envy of your neighborhood. 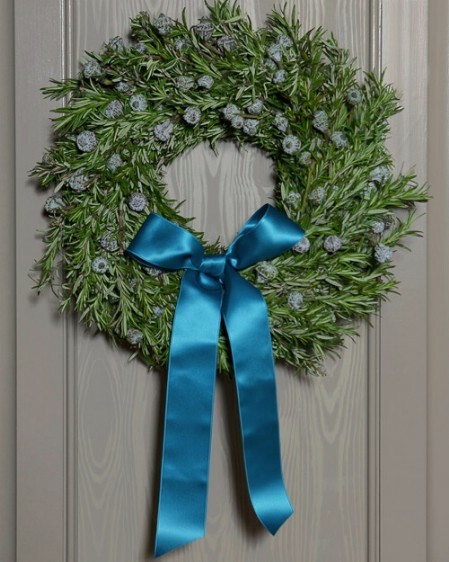 The blues perfectly complement the reds and give you a wreath that not only shows off those beautiful spring colors but creates a focal point for the front of your home. Adorn the wreath with leaves, flowers or a deep red toned bird’s nest to give it additional flair. Take that twig wreath form and add a small woven basket to create a beautiful display for your front door. 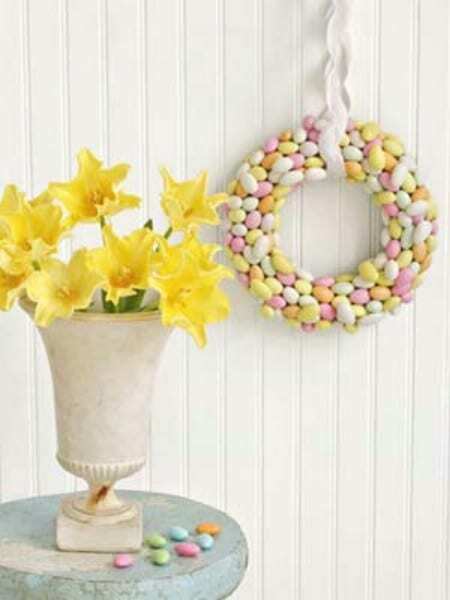 This Easter basket wreath is sure to be a hit and you can decorate the basket however you like. Add fresh or silk tulips or other springtime flowers to make it really colorful or you can fill the basket with fake grass and add some of those leftover plastic eggs. Colorful cupcake liners are perfect for creating a beautiful wreath. You can make this from just one package of liners in a single or multiple colors. Choose pastel colored liners for a real springtime look or use vibrant deep colors to create a jewel toned wreath. The wreath can then be embellished with smaller Easter decorations or you can allow it to stand alone, whatever your preference. The entire wreath will cost less than $10 to create. You can pick up a wreath form at most craft stores that has a small basket at the bottom which is perfect for creating this little bunny wreath. If you don’t have a basket wreath form or you don’t want to buy one, you can easily attach a twig basket to the bottom of a twig wreath to create the look. Add a small stuffed or porcelain bunny and ribbons and other decorations to make it elegant or add splashes of color to make it fun. This beautiful and very unique wreath uses small seed pots painted in vibrant colors to create a stunning display for your front door. 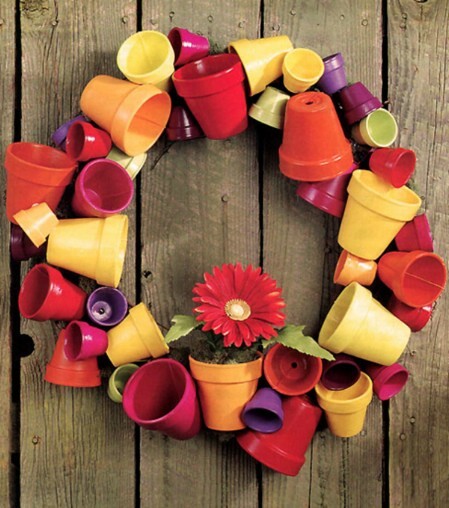 The pots are different sizes to give the wreath depth but you can use whatever colors you want. Plastic pots work well because they are a bit lighter in weight and you can adorn the wreath with flowers or anything you like to make it your own. 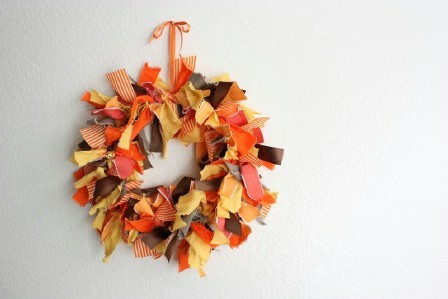 This wreath is designed for fall but you could use pastels and brighter colors to make it perfect for spring. If you have fabric leftover from other projects or you have old clothing that you have no use for any longer, you can cut them into strips to create this beautiful wreath, which is as easy to make as it is lovely to look at. You can make it as full or as thin as you like and adorn with anything you wish or leave it plain for a really elegant look. 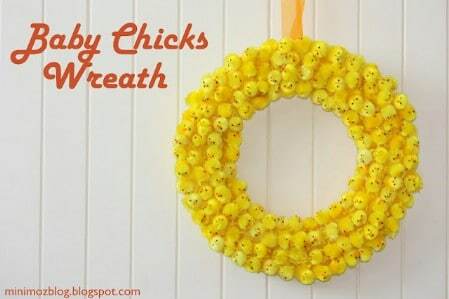 Tiny stuffed chicks create this whimsical wreath that can be decorated any way you like. You can normally find these chicks for a dollar or so a bag or if you want to hit the clearance aisle just after Easter, you can get them for less than that and have them on hand for next year. The little stuffed chicks are adorable and you could even add a stuffed birdie or two if you really want to make it unique. A small rolled up garden hose adorned with flowers and ribbon make the perfect springtime wreath. If you have just a small piece of garden hose, you can create this adorable wreath and then just add fresh or silk flowers. 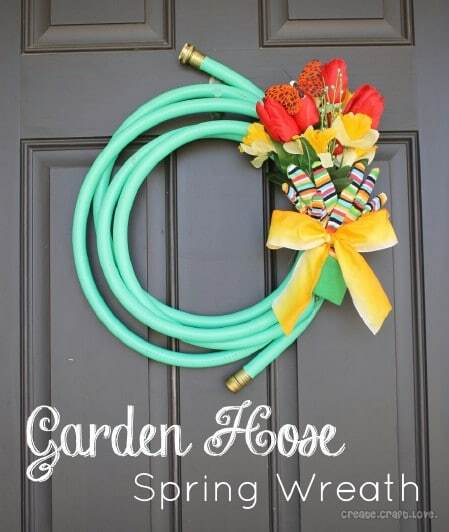 This is a great idea for those of you who are really avid gardeners or someone who just wants a completely unique wreath idea for their front door this spring. 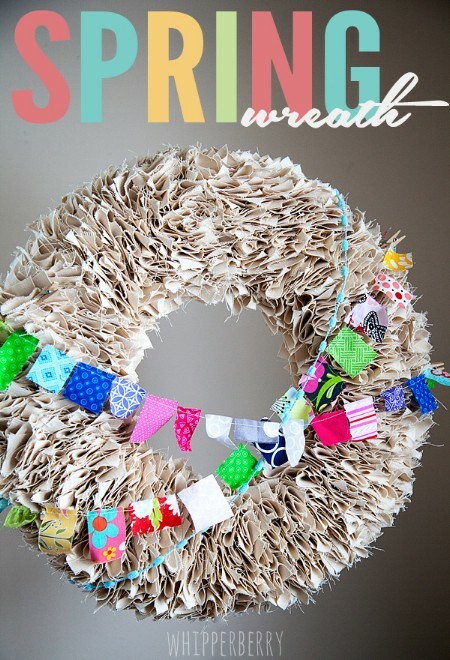 Strips of fabric in a solid pastel color and then other colorful strips for accent can be put together to create a stunning wreath for the front door or just anywhere you want splashes of springtime colors. You can cut the fabric in squares or use old quilting squares if you have them on hand and want the wreath to be multi-colored. This is an easy wreath that won’t cost anything if you have the fabric on hand and takes just a couple of hours to put together. This patriotic wreath can easily be modified to include springtime colors. You will need several spools of thread to make this if you want it to be really full so remember to keep those spools that are running low. Pastel colors work very well for creating a thread spool spring wreath or you could use all of the colors that you have on hand and then tie it all together with a pastel ribbon or bow. 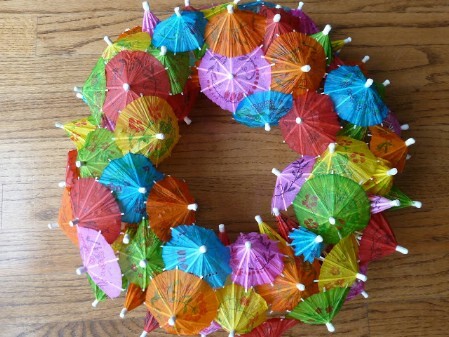 Colorful cocktail umbrellas are great for creating a springtime wreath. They come in a wide assortment of colors and you can normally buy them by the box at craft or party stores for very little. If you tend to mix your own cocktails, you may have some already on hand. 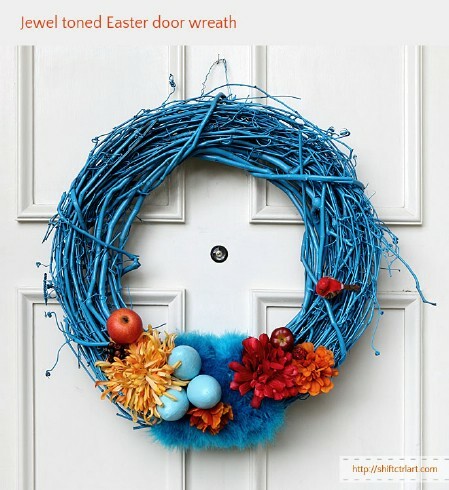 You can decorate your wreath with any number of Easter themed adornments and give your front door a tropical look this spring. Paper doilies come pretty cheap. In fact, you can pick up a pack of several for just a dollar or so depending on their size. You can use those doilies to create a beautiful wreath and then decorate it with springtime flowers, Easter eggs or any number of other adornments. Add some clear Christmas lights to really make it stand out and help with outdoor lighting for late night Easter get-togethers. 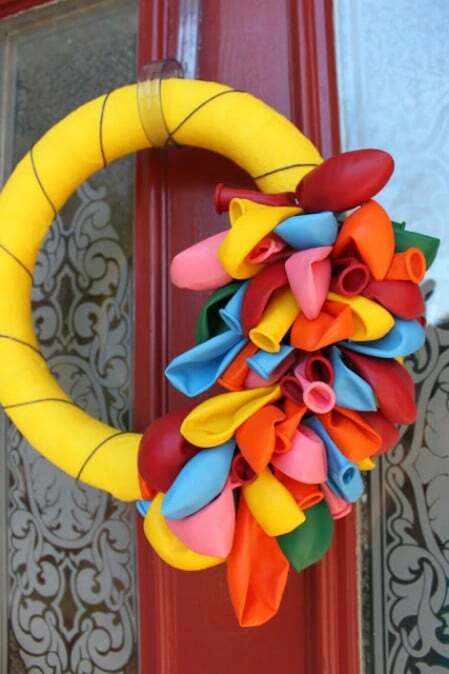 Use those colorful balloons to create a fun and adorable wreath for your door this Easter. You just have to attach them (not blown up of course) to your wreath form and they give you a splash of color that is sure to be a hit. You can add Easter themed decorations if you want or put in a few colorful flowers to make your wreath last long past Easter and into summer. Why not make a wreath that is healthy as well as beautiful? If you tend to grow your own herbs, you can use those herbs to form the wreath and then just embellish it with plastic or wooden eggs, small chicks or bunnies or just anything that is Easter related. You can also add fresh or silk flowers which will give a beautiful contrast to the green and brown of your herbs. You can create cute little tape leaves that you can use to form a lovely wreath in vibrant green or choose pastel colors to make it more spring like. 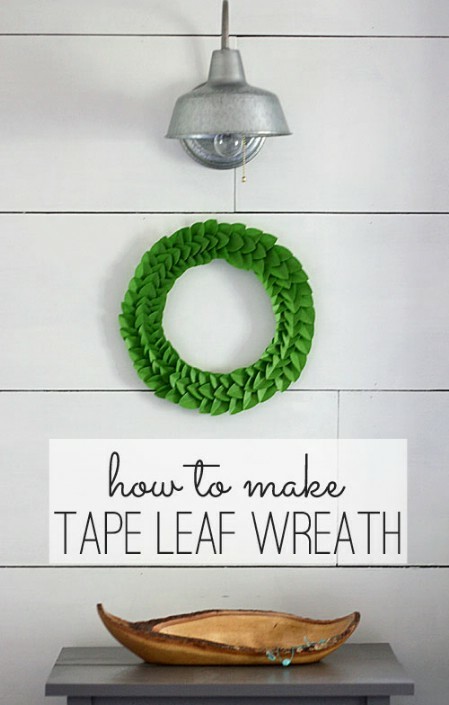 You can also add colorful eggs or other decorations to the green tape leaves that you form to create a really colorful and very springy wreath that is sure to get attention from everyone who passes by your home. Wooden clothespins are really cheap. You can pick up a pack of around 100 for about a dollar or so at your local Dollar Store. Painted in beautiful and vibrant pastel colors, those clothespins can be put together to form a lovely wreath that you can then embellish with your favorite Easter decorations, silk flowers or small plastic Easter eggs. 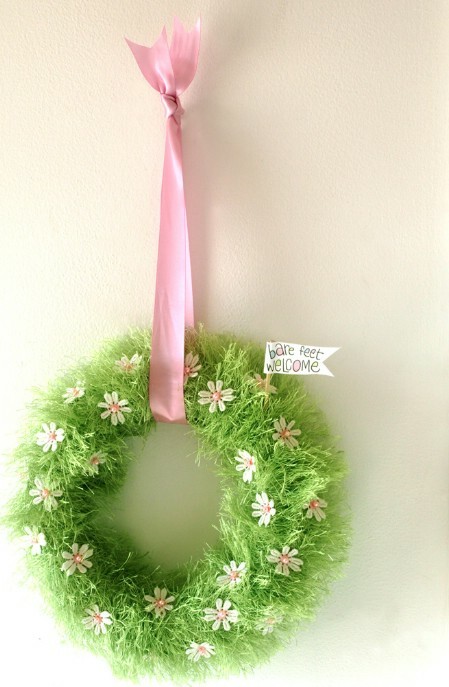 You can hang your wreath with a pastel colored ribbon to really give it a springtime look. Those colorful tea packages that hold your favorite tea flavors can be put to excellent use even after you have used up the tea bags. You can buy loads of different flavored teas, all of which will come in packages of different colors. 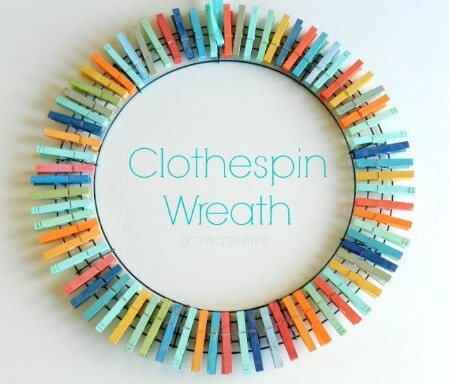 These can be put together to make a beautiful wreath when you add some colorful clothespins and other adornments. 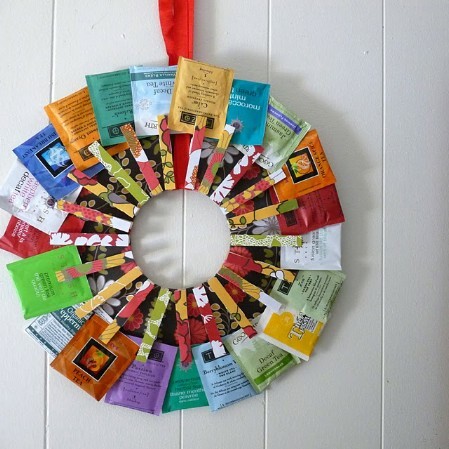 Give your front door extra-special flair this spring with this adorable tea wreath. 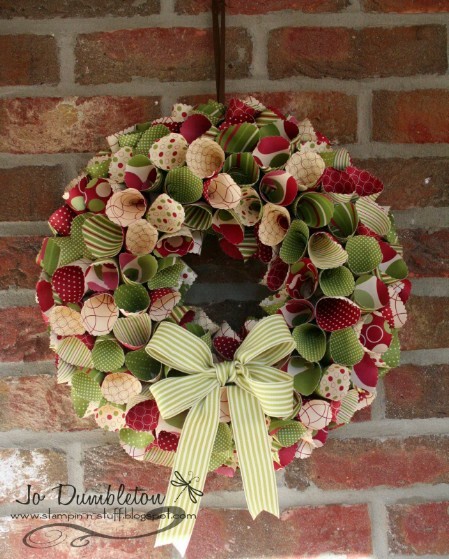 This is a beautiful wreath that will take a little time, but it is definitely worth the work. You can choose pastel colors or go with the light brown and add accents in spring colors. The great thing about this wreath is you don’t have to have a wreath form. You make your own out of cardboard or other materials and then form the wreath around them to create a stunning display that you will be proud to hang on your front door. 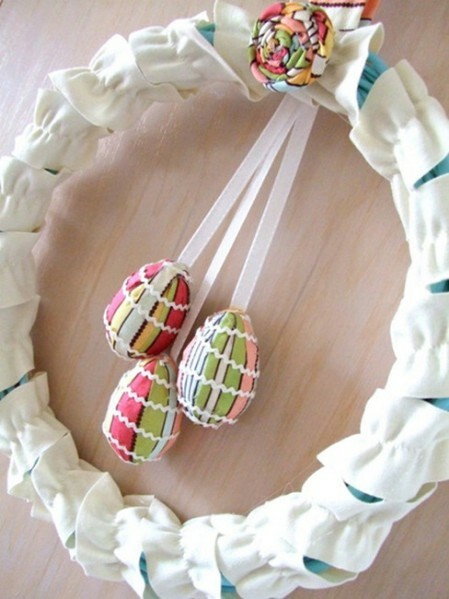 Strips of torn fabric and robin’s eggs create a beautiful wreath that you can display well past Easter if you want. This ragged wreath is chic and shabby and perfect for those who want a bit of country charm to their Easter decorating. 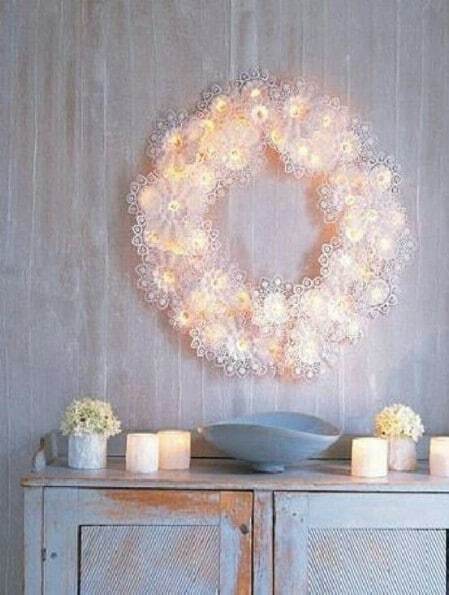 You can use a wreath form that is already made or make one yourself and then simply cover it with your fabric and eggs. Use wooden or plastic eggs or you could substitute robin’s egg candies if you are so inclined – just be sure to preserve them well.